Hello all you Funkadelics.....Welcome to my personal Page. Thanks for crusing on in. 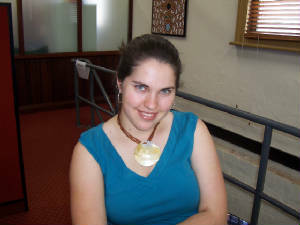 Some of you may have come through my outreach site PaThLiGhT and others have just arrived coz I've told you to come and you figured I was a bit of a weirdo so you should get to know more about me. here 'tis your ultimate companion to 'el-green-freako'. Okay for starters I love the sound of a ticking clock I don't know why. maybe its symbolic. Another important think you gotta know about me is I LIKE GREEN! But don't get me wrong, It's a not really a froggish kind of green obsession...more like a hmmm...tree green obsession. *and you're all scratching your heads going 'huh?' but believe me there is a big difference in shades between a tree and a frog* unless you are a green tree frog. I once looked up every verse in the Bible that mentions green. I know, I know. But what can I say? I wouldn't be living up to me reputation as a green God-fearing hippie if I didn't like Green. So there. 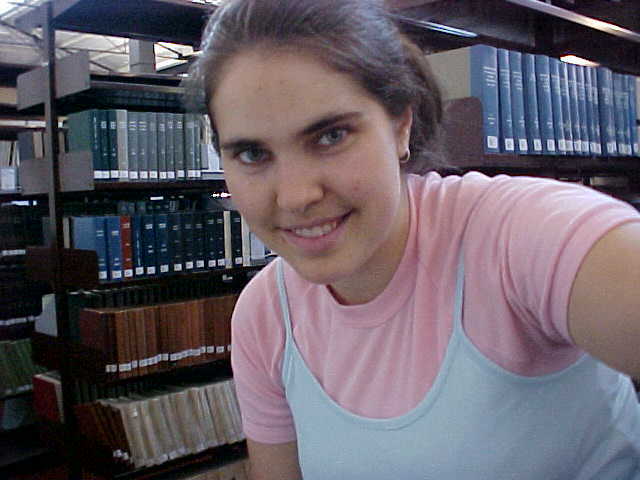 above: me in the library at University, I spend so much time there I'm thinking of moving my bed in. 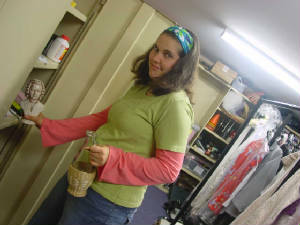 below: me in the costume cupboard (when I was on my drama teaching prac), putting away props. 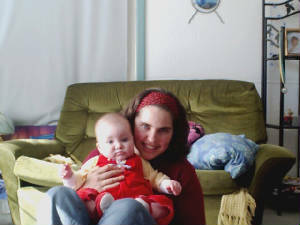 Me and my little neice, Mikayla, the cutest, funniest and smartest little whirlwind on the planet! mail me with your suggestions and comments I love to hear from you. Please note: marriage proposals not accepted at this time except from a select few, credit cards always welcome and no teddybears were harmed in the creation of this site.